6/52 Les Winan By far the best Bond movie in years. Daniel Craig is terrific and the movie really benefits from the focus on (relative) realism and actual acting. 10/65 Kim Hollis An awesome reboot for a series that I lost interest in years ago. 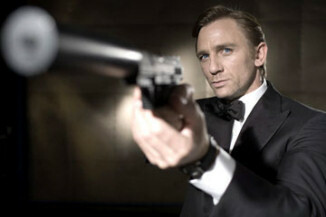 Daniel Craig=hubba hubba. 16/47 Amanda Jones My first Bond filme ever. Entertaining some, but in serious need of editing. 58/159 David Mumpower Bond as a thug is a strange choice and the movie's ending is overblown but this is still a great action flick. 103/200 Max Braden This was one of the bigger letdowns in comparison to its good trailer this year. Mystery writer Raymond Chandler says that James Bond is "what every man would like to be and what every woman would like to have between her sheets." Perhaps it's this quality that has allowed the character to survive for more than 40 years, through various actors and generation gaps. Over the years, Bond has practically defined the careers of performers such as Sean Connery, Roger Moore, and Pierce Brosnan. Eventually, the torch is handed over to someone new, as the Broccoli family keeps making Bond films and MGM (soon to be under the umbrella of Sony) is happy to oblige with distribution and financing. For the 21st film in the Bond series, the producers and director Martin Campbell (who brought the series back to life with GoldenEye) will look to the very first novel in the Ian Fleming series, Casino Royale. Previously created as a spoof of the series starring Peter Sellers and David Niven, this time the story will be given the action-packed Bond approach that fans of the series have become accustomed to. The book had Bond assigned to a seemingly posh task - preventing a Russian spy known as Le Chiffre from his attempt to win 50 million French francs. It seems Le Chiffre needs to regain some KGB cash that he lost as a result of an investment in a chain of brothels. Since 007 is known to be the best gambler in Her Majesty's Secret Service, he's selected to go out and break Le Chiffre's bank at the gaming tables of the French Riviera's Casino Royale. See the latest developments for this project on the Casino Royale Movie News page.